But this was a new kind of war, fought in the Confederate city of Louisville, using modern weapons and tactics. As Confederate General Stonewall Jackson used the Confederate States Army to again demonstrat his military expertise, the North struggled to find a leader who could prove his equal for the United States Army. In the Second War Between the States, the times, the stakes, and the battle lines had changed–and so would history. This 26 Hour Scenario will be produced by Brandon Decker of Smokey Scenarios. SPECIAL ENTRY/PAINT If Pre-Regged by 7/28/19, is $99 and includes ENTRY and One CASE of VALKEN PAINTBALLS. ENTRY ONLY If Pre-Regged by 7/28/19, is $40 and includes the entire Weekend of PURE SCENARIO FUN, Unlimited Compressed Air or Maximum of two CO2 Fills per Hour per Person, or the Standard Rental Package consisting of a TIPPMANN Semi-Auto Marker, Goggles, C/A Bottle, and unlimited C/A. HERO ENTRY DISCOUNT If Pre-Regged by 7/28/19, is 25% OFF ($30) for All Active and Veteran Military, Police, and Fire Fighters from the US and Canada. Must Show Valid Hero ID when Checking In. ONLY PLAYERS THAT PREREG BY 7/28/19 CAN REQUEST A SPECIFIC SIDE. After that, all players will be assigned to the side deemed necessary to balance the teams. VALKEN PAINTBALLS If Pre-Paid by 7/28/19, are $65 per Case of 2000 and $20 per Bag of 500. SPORTS SMOKE If Pre-Paid by 7/28/19, is at the Discounted Price of $10.00 ea or 6 for $58 for the Tactical Smoke Grenades (TSG) and $21 ea or 6 for $120 for the Battlefield Smoke Grenade (BFG). RENTAL UPGRADE If Pre-Paid by 7/28/19, is $20 for an Eclipse Etha, Electronic Hopper, and 3000 PSI HP Tank. Limited Quantities! AFTER 7/28/19 UNTIL 8/4/19, Entry is then $45, Case of Paint $70, Bag of Paint $22.50, and Sports Smoke & Rental Upgrade Purchases are Only Available at the Event. BUNKHOUSE Lodging costs $10 Per Person to stay in for the Entire Event if Paid For by 7/28/19 and should be reserved in advance with Pre-Registration to guarantee a spot. After 7/28/19 each bunkhouse spot is $15. To reserve Your Own Private Bunkhouse, the cost is $100 for the Entire Event if Paid For by 7/28/19 plus a Refundable $50 Deposit and should be reserved in advance with Pre-Registration to guarantee a Private Bunkhouse. After 7/28/19 it is $125 plus $50 Deposit. 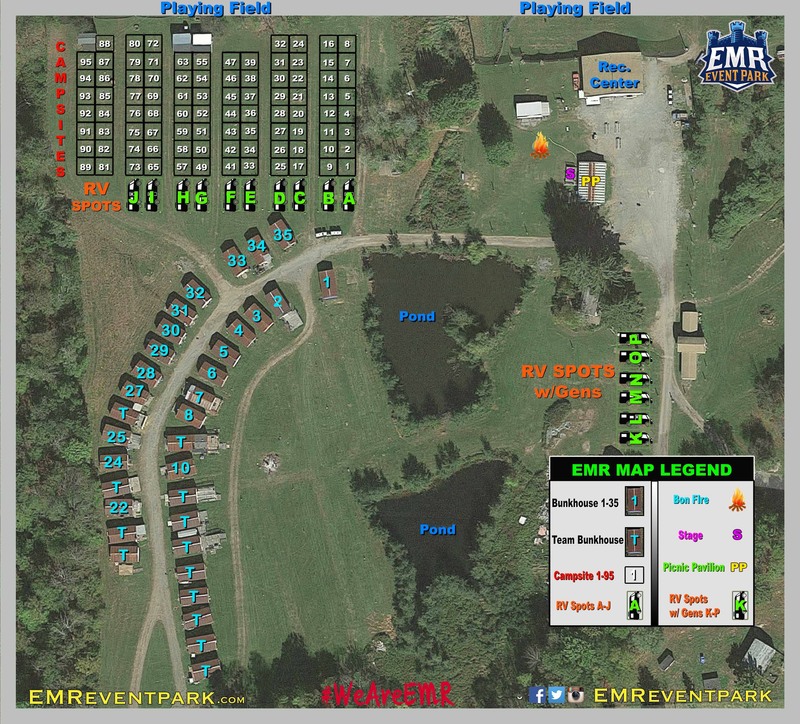 CAMPSITES for Tents and Campers are 20’ x 20’ and Cost $10 Per Campsite for the Entire Event if Paid For by 7/28/19. More than one site may be reserved at $10 Per Site. After 7/28/19 through 8/4/19, Each Site is $15. RV SITES are 20’ x 40’ and Cost $20 Per Site if Paid For by 7/28/19, however there are no water or electric hook-ups for the RVs. You must notify us if you wish to run a Generator past Midnight and if so, you will be assigned a spot apart from the Campgrounds. Walk-on players are not guaranteed Campsites or RV Sites. After 7/28/19 through 8/4/19, RV Sites are $30 Each. NO DOGS ALLOWED ON EMR FACILITY due to Insurance Regulations! Although we are sure that you have “The Nicest Puppy in the World”, Our Insurance Company will not Cover Dogs and we cannot risk our business and livelihood by allowing you to bring yours. The F.O. will alert a game ref before it is deployed. Anyone, friend or foe, caught inside the smoke cloud will be eliminated. The barrage lasts as long as the grenade does. The area the barrage covers is the same as the area of the smoke grenade. Players eliminated by this may not use the Mobile Field Surgeon. Engineers are specially designated players that are able to repair destroyed structures and destroy them. They are the only players who will be able to use a TNT bundle and must have their Engineer card on hand. Engineers may also destroy structures and River MonitorsTNT bundles. The Engineer is the only one who can use the TNT bundle. They must alert a game official before using it. Engineers will be identified by additional orange tape on their left arm. River monitors are heavily armed and armored gun boats that both the Yankees and Rebels have constructed. They are able to provide fire-support to the infantry. While confined to the rivers and canals, they can only be sunk by other River Monitors and TNT bundles. ALL MONITORS MUST PROVIDE PROOF OF LIABILITY INSURANCE COVERING THEMSELVES AND EMR and are required to provide their own Walking Ref to ensure Player Safety on the Field. The CONFEDERATE STATES ARMY will be commanded by Rob “BGR” Maxwell and the UNITED STATES ARMY will be commanded by Patrick WHALEN. Commander Awards and Prize Giveaways will be held at the stage on Sunday after SIEGE OF LOUISVILLE is over. 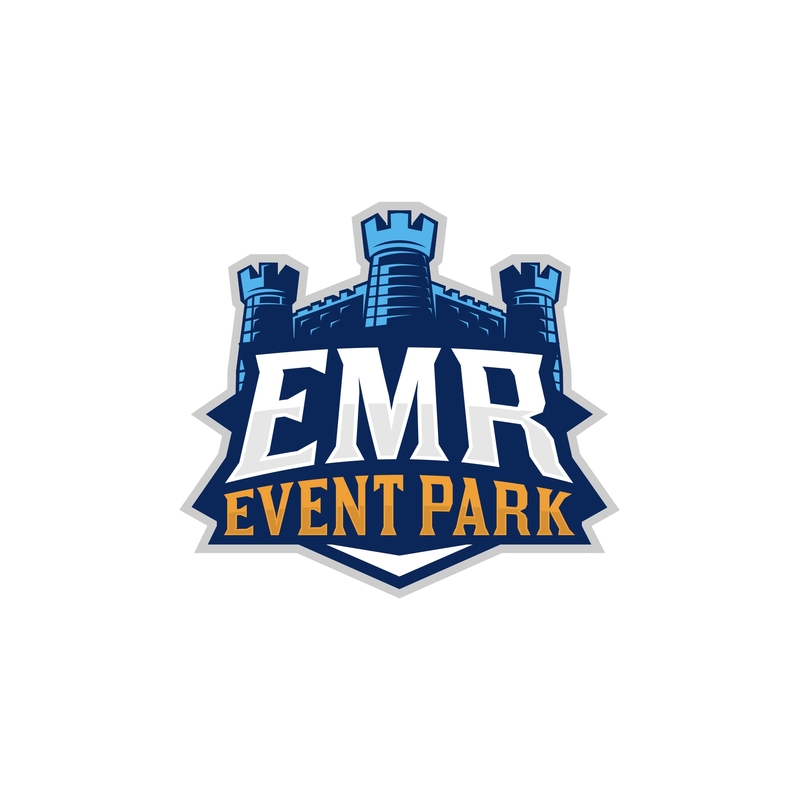 All Prizes are supplied by the Vendors and EMR EVENT SPONSORS!